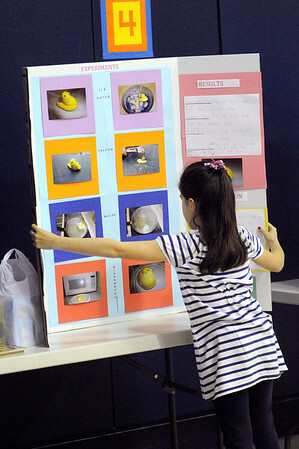 Paris O'Brien, third grader, unfolds her science project display at the beginning of the 1st Annual Science Fair at Hannah School in Beverly. Her project explored how hot and cold affect marshmallo Peeps. Photo by Ken Yuszkus/Salem News, Tuesday, April 12, 2011.